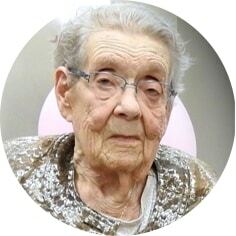 Edna Robinson (née: Ward), long-time resident of the Cardross, SK district, passed away on Saturday, March 30th, 2019. Edna lived her life to the fullest for 100 years and 8 months. Edna embraced and celebrated those 100 years on her birthday, August 15th, 2018 with the gathering of five generations. She was predeceased by her husband, Lyle in 1984; her parents – father Sidney Ward, and her mother and stepfather Sarah and Charles McLeod; brothers: Lloyd and Luella, Barclay and Gertrude, Oscar and Adeline; Lyle’s family who she loved as her own – parents, William and Eva Robinson; sisters and brothers-in-law: Alida and Robert Noble, Gertrude and Barclay Ward, Evelyn and Sam Pickard, Oma and Jack Pickard, Waldo and Norma Robinson, Ronald Robinson, and Larry Robinson. Edna leaves many cherished memories to her family: daughter, Janeth and Gerald Muldoon; granddaughter, Sloane; grandson, Derrek and Stacey; great-granddaughter, Heather and Ryan; great-grandson, Ryan and Beth; great-great-grandson, Hunter; and most recently welcomed to our family, Emily and Kade; sisters-in-law, Myrtle Robinson and Zena Robinson; the Alberta Ward family; the Manitoba Robinson family; as well as many nieces and nephews, extending five generations. The Funeral Service will be held on Friday, April 5th, 2019 at 11:00 a.m. in Moose Jaw Funeral Home. Pastor Bill Luther will officiate and interment will take place at Rosedale Cemetery. As an expression of sympathy, donations in Edna’s name may be made to the Jim Pattison Children’s Hospital Foundation, 1-345 3rd Ave S, Saskatoon SK S7K 1M6 or to the Ross-Payant Centennial Nursing Home for the Family Room Project, Box 1120, Assiniboia, SK S0H 0B0. Arrangements are entrusted to Moose Jaw Funeral Home, 268 Mulberry Lane. James Murdock, Funeral Director 306-693-4550. Sorry to hear the death of Mrs.Edna Robinson, and to know she has lived so long. I personal want to share my sincere sympathy to the family, and to share with you the Bible promise, that we could see her alive again. As mention in 1Corinthians 15:21-26. So sorry to the entire Muldoon family for your loss. Very sorry to hear this sad news. Hoping that your many memories will help you face the days ahead. The loss of Your Mother and Grandmother is sad,she was a wonderful Lady. Our deepest sympathy from Eric and June Mallmes. Janeth & Family – sincere condolences on your loss. Special moments from the past are the memories that all who knew Edna will cherish forever. It’s the little things, the small, everyday occurrences that you’ll remember. The laughs, the stories, the smiles. Sincere condolences to the family on your great loss from the Peterson family.